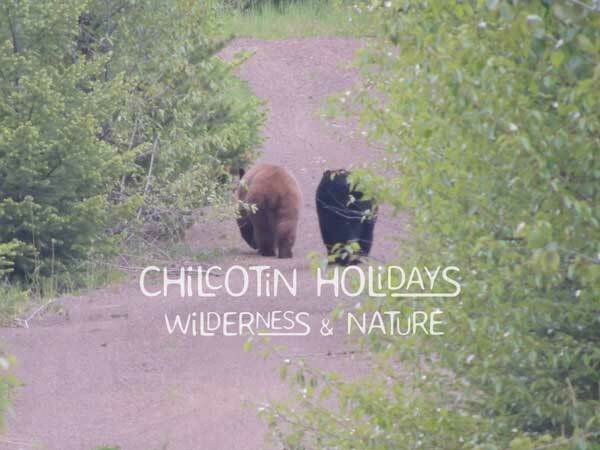 Observing 10 bears in the wild is not an experience that many of us have had, that's why I want to share that wonderful experience. What an experience to go to the wild, looking for bears. I had the chance to join a team a few nights ago, and we literally got spoiled. Not only we have seen bears, we had the chance to watch them in their natural habitat, the wild. It's quite scary at first to think about that huge and strong animal being so close to us. But then I realized if you don't do anything the bear could take as a challenge or easy prey, they end up forgetting we were around. At first we saw only one black bear coming down the gravel road towards us. He had smelt and saw us though and was still coming down our way. That's only after a few minutes that we realized he wasn't by himself, another black bear with a cinnamon color was right behind the bush few meters away from the first one. Amazing! All of us were speechless because it's really unusual for bears to hang out together. Actually the mother has to leave with the cubs otherwise they might get killed by the father, that's how they keep they balance their numbers. We spent at least 15 minutes watching them watching us, calmly sitting and then heading out. What an experience! The way they move is very cute, but you can also see their strength, through the fair amount of fur. I won't get enough of that I think. That night we saw 10 of them in total, all black bears but some with a cinnamon color. We think these 2 were one male and one big female, also we saw 3 running in front of the car, one eating grass on the side of the road and the last 3 were a mother and her 2 cubs. They were not afraid as they kept coming back on the side of the road. It was 3 hours of bear watching, in the wild, absolutely breath taking. I'm going to cherish that experience and keep being aware on my environment, let's not forget how powerful they are even if we like to refer to them as teddybear.